Great piece in the Washington Post about the challenges to fruit growers and breeders arising from the changing climate. 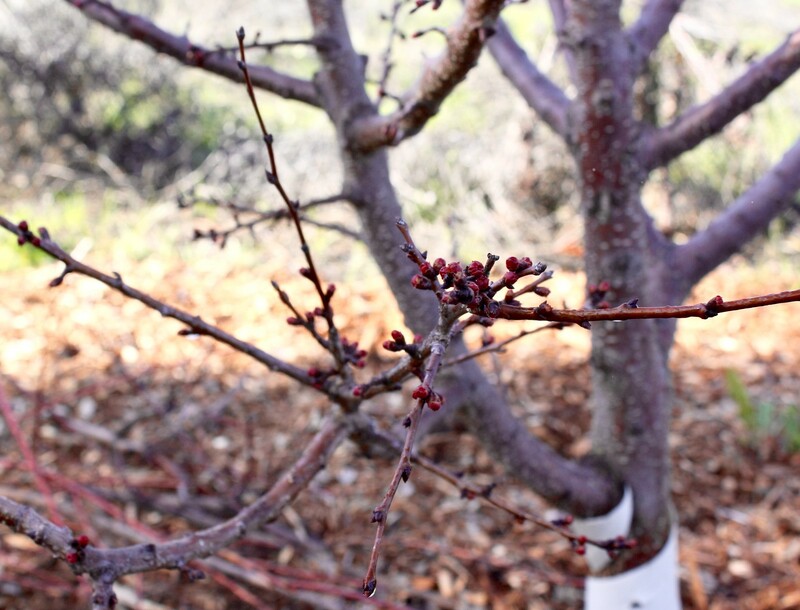 Breeders of deciduous fruits are racing to find varieties that can cope with reduced winter chill and more erratic springs, which are featuring more substantial swings of frost and warmth. We have been dealing with heavy smoke from the Camp Fire in Butte County, which is a couple hours’ drive north of us. The weather conditions have been such that the smoke has settled and some days it has been like a fog that starts out moderately thick and never totally clears. What I did not expect was that it would be so cold during this smoky phase. The fire began on 8 November, and the winds that initially made the fire so devastating died down late in the day on the 11th. Since then, we have had six straight mornings with low temperatures at 36F or lower, including three at 32 and two more at 33. This is substantially colder than the norm for this time of year. Usually–at least in the years I have been at this location–we do not get a morning below 32 until some time in December. I would not have expected smoke to help keep it so cool overnight. Perhaps naively, I would have expected it to act more like cloud cover. Evidently, however, the fire has had the effect of getting our winter-chilling off to an early start. The deciduous trees are presumably dormant enough by now to “receive” chill, so this early cold snap is a good start. The fire has been one of the worst disasters in the state in some time, and the air quality has resulted in UC Davis being shut down since 12 November and through the upcoming Thanksgiving holiday. Through all the awfulness, these cold mornings have been welcome. The ‘Canadian White Blenheim’ apricot has reached full bloom. It has the pinkest flowers of any of the ten or so apricot varieties I’ve ever grown over many years. Strange, given that its fruit has one of the palest flesh tones of any apricot. This variety has fruited for me before, both here and in inland San Diego County. However, we have never had more than a few fruits in any one year, and the modal number of fruits of this variety per year has been zero. That is because it has had blooms that were anything but profuse. It is a pretty clear law of fruit-growing that if you have no blooms, you get no fruit. There was no question of chill not being met this year. While January was quite warm, both December and February had good long periods of chilly weather and deep cold snaps. 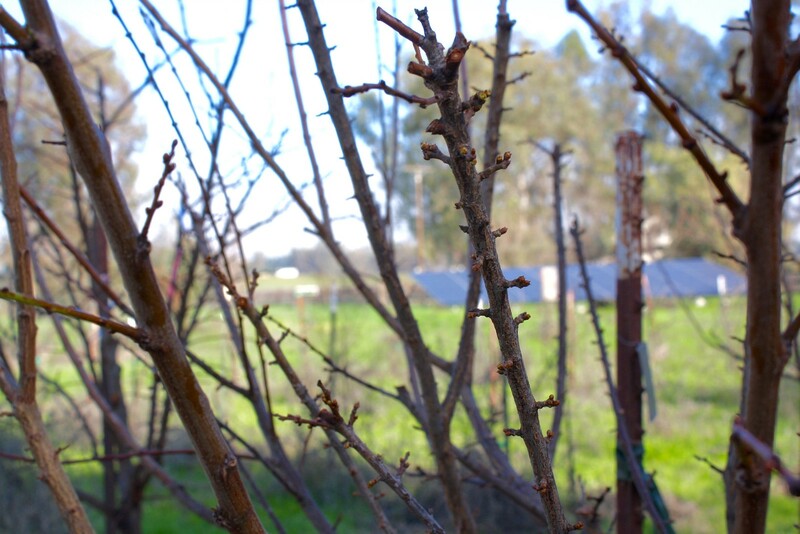 In fact, the big fear I had was that an unusually late cold snap would adversely affect fruit trees, many of which typically begin blooming here by mid-February. Indeed, the ‘Flavor Delight’ aprium was in full bloom just when a hard freeze hit. While the tree’s foliage has recovered, there is no sign of any fruit set. The freeze hit it at just the wrong time. Meanwhile, the ‘Royal’ (‘Blenheim’) apricot has had an odd spring. Normally, it would be blooming in mid/late February. It has a relatively low chilling requirement (from much experience, I’d estimate it at around 350, even though many catalogs and other sources say 400-500). Yet it remained mostly dormant until well into March. And it was not just my own rather old tree; a few trees with ‘Royal’ tags on them, planted on the UC Davis campus a few years ago, did the same. This is very strange. Perhaps even stranger is that just now my ‘Royal’ is blooming like the ‘Canadian White Blenheim’ normally does–after it has leafed out. It has about a dozen blooms right now, scattered amidst well developed foliage. In many years of growing this variety, I have never seen it do this. So, just as one variety that normally blooms sporadically post-leaf-out is instead having a more normal-looking bloom, here an old reliable is exhibiting the staggered behavior of a tree that got insufficient chill. It has been an odd winter, and even odder bloom season. It is too early to know if the white apricots will set fruit. I express that in the plural, because the ‘Monique’–another even whiter variety that also is hard to get to set in our climate–also had a pretty good bloom this year. The ‘Hunza‘ (a real favorite of mine with luscious complex-tasting flesh and an edible kernel) also is in full bloom right now. So, while one can’t count one’s fruit this early*, indications are promising for the later-blooming trees. Another law of fruit-growing is that a profuse bloom does not guarantee a good fruit crop, but it certainly makes it more likely. *Today is the eve of Pesach (Passover). Somewhere in the Talmud it is suggested that Shavuot is the “Yom Kippur of fruit trees”, the day one which they are judged. That is about right, as in roughly fifty days we will have passed through (over?) the most perilous time for developing fruit. What holds that long has a pretty good chance of making it. It has been foggy in recent days. Far from my favorite kind of weather, especially when it sticks around all day. Sometimes, however, it can be good for the chilling hours accumulation that the deciduous fruit trees need. 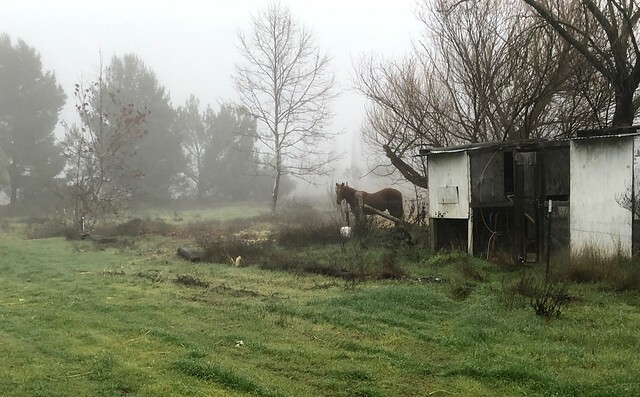 It is the tendency towards multi-day dense fog events that has made the San Joaquin Valley (south of here) historically a good place for prunes, peaches, apricots, and other fruits that need winter chill to set well in the subsequent growing season. However, this has been the case with this fog event only on one day, when we had a low of 39F and, due to the fog, the temperature did not reach 50 till after 10:00 a.m. Prime chilling temperatures are roughly 38 to 45, with some continuing but significantly diminishing value up to the lower 50s. So that day was a good chill day. Not so much since. For the past two days, the temperature has just hovered in the 45-51 range. That’s pretty close to useless. Temperatures are warming more in winter than other seasons, according to research carried out in the Central Valley, including here in Yolo County, by UC Agricultural and Natural Resources (UCANR). That is bad news for growers of deciduous nut and fruit trees. I have used both (in my San Diego County days) sprinkling during warm spells and painting of trunks and major branches to boost chances of production on varieties that are a bit marginal for my area. Orchard rows on Dec. 19, 2016. Trees in background just pruned. Those in front not yet, at the time. That’s the ultra-vigorous ‘Shaa Kar Pareh’ apricot in front. Such tactics won’t be necessary for me this winter, however. We have had an exceptionally–by recent standards–chilly winter. At my location, December’s mean low and high temperatures were 36.8 and 54.9F, which is slightly below long-term averages for nearby stations (Davis and Vacaville). By comparison, our monthly means for December, 2015, were 39.4, 55.1; in December, 2014 they were 47.1, 58.0 (!). This January, so far: 40.8, 52.2. The days have been cool, for sure! And that is much better than January, 2016: 43.9, 55.8; 2015: 39.0, 59.8 (!). Yes, 2014-2015 was pretty bad for the deciduous fruit trees. My trees should like this winter a lot! Now, if only we can avoid really heavy rain in the bloom period. Given the trend so far this winter–on track for possibly the wettest ever recorded–that is certainly not something I can count on. 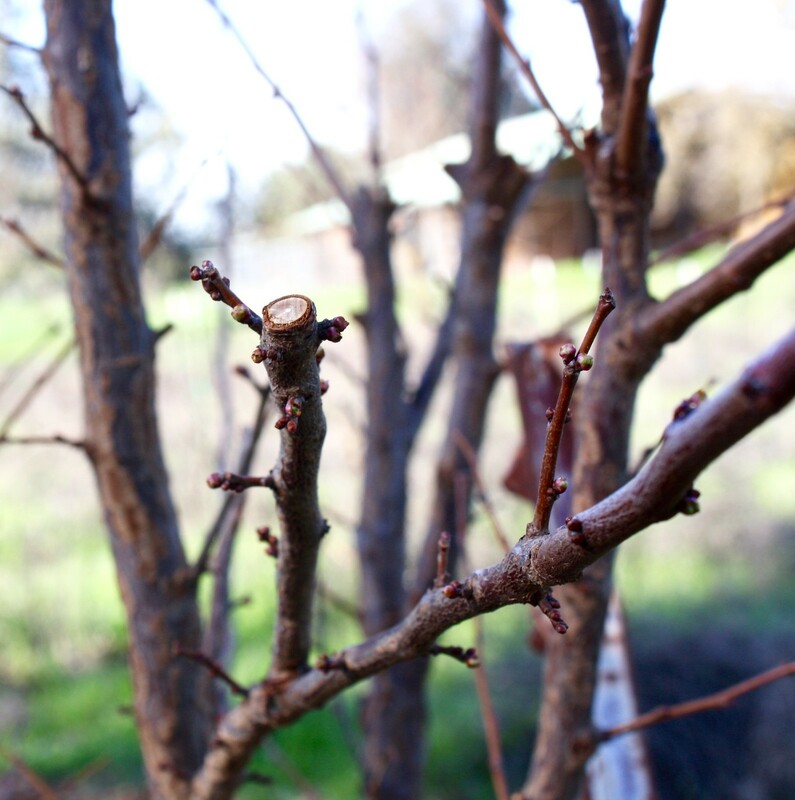 Normally, the first signs of fruit trees getting ready to bloom would be a time of excitement. But when several trees are showing such signs on the 26th of January, it is more a cause of concern. It would be one thing if the trees are almonds. 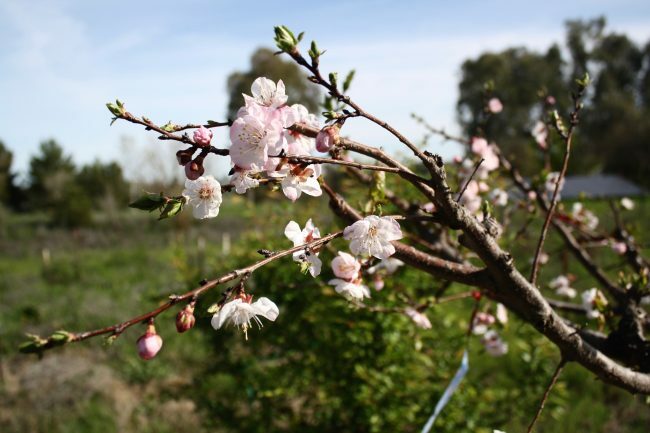 We just had Tu Bi-Shvat yesterday, after all, and this Jewish ‘New Year for the Trees’ is suppose to be at roughly the time that the almond trees begin blooming in the Land of Israel. And much of California, including this location, has a ‘mediterranean’ climate type, as has Israel. 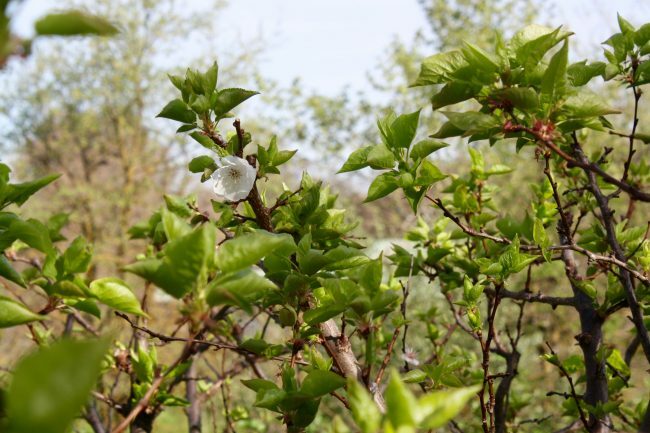 Yet this year we will have a second month of Adar, inserted because Tu Bi-Shvat has come “too early”; the almond trees are not supposed to be in bloom yet, and we need to adjust the calendar to keep Pesach (Passover) in its proper season–the full flowering of spring. I am told by a contact that almonds already are in bloom in Israel. Mine are merely showing the very early signs of readying to bloom. 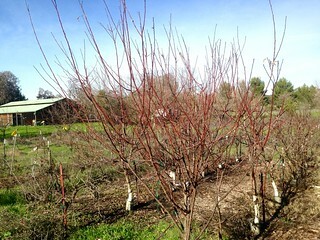 However, several other trees that should flower after the almonds are gearing up. And that is a worrisome sign of a spring coming too early. We still have winter rains to get through–expected to be heavy later this week, and probably in much of February–and the ever-present danger of wintertime frost and freeze, which can wreak havoc on blooms and young fruitlets. This is the ‘Flavor Delight‘ aprium. Look at all those red buds. It will be blooming soon. ‘Flavor Delight’ tends to bloom early, but this is more than a week ahead of last year, when it was actually a warmer winter. This is a variety with an evidently low chilling requirement, so once the weather warms enough, it will bloom early. But this early? (I might have expected that in San Diego, but not this far north.) The first bud swell for this tree in 2015 was 3 February. Its current status is more than just early bud swell. Those are about to burst! A little over a week early may not seem like much, but I would have thought last year’s was early, and yet this year it is even earlier. I suppose we might have to get used to “early” blooming as the new normal, as the climate continues its general warming trend. All three of my pluots are also showing signs of waking up. I have ‘Flavor King‘, ‘Splash‘ and ‘Flavor Finale‘ varieties. The first two of those began to show some bud swell around 15 February last year, but the whole tree was not showing swell till another week after that. The ‘Flavor Finale’ did not begin to show its very first bud swell last year till 22 February. So these trees are really early! One good thing is that maybe they will all bloom together. My cross-pollination was not good last year, because the ‘Flavor Finale’ did not really get going till the other two were nearly done. As for the almonds, they have their buds swelling, too. Still, it is striking that they will not be substantially earlier to bloom than some of the fruit trees. Things are just a bit whacky this “spring” so far. Our temperatures; look how cold December was in 2013 and how warm it was for the average overnight in 2014! Also how warm January daytime highs were in 2014. This month it has been cloudy most of the time (and raining! ), so the the lows have been warmer at the same time as the highs have been cool. In the two prior years, January was essentially cloudless and dry. The forecast says the snow level will drop to as low as 2000 feet Saturday evening, locally 1000. We are at 1500. It has been a really cold week, by local standards, especially for late February. Too bad all this chill is basically useless for the deciduous fruit trees, coming this late. We surpassed 500 chill hours earlier this month. However, we really won’t get more useful chill, as almost everything is leafing out or blooming by now. And getting snow, or freezing temperatures on the buds and blooms is not a good thing.